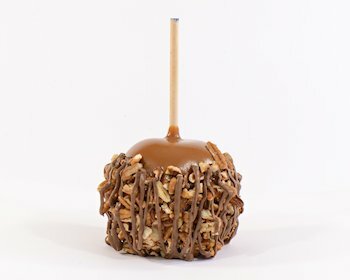 A fresh apple drenched in homemade copper-kettle caramel, adorned with pecans then drizzled with chocolate. 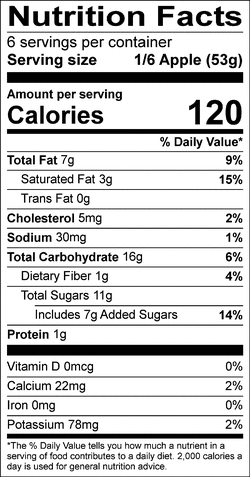 INGREDIENTS: apples, pecans, corn syrup solids, water, sugar, milk chocolate (sugar, cocoa butter, milk, chocolate liquor, soy lecithin - an emulsifier, vanilla), evaporated milk (milk, dipotassium phosphate, carrageenan, Vitamin D), cream powder (cream, nonfat milk solids, sodium caseinate), butter (cream, salt), palm oil with soya lecithin, salt, vanillin - an artificial flavor. CONTAINS MILK, PECAN, SOY. PRODUCED IN A SHARED SURFACE FACILITY THAT PROCESSES: PEANUT, TREE NUTS, EGG AND WHEAT.